Bedford, Massachusetts – August 30, 2013–METTLER TOLEDO Thornton, a leading provider of pure water analytical measurement solutions, announces the expansion of its conductivity sensor portfolio with the UniCond® 4-E digital sensors. The new four-electrode sensors have been designed to provide highly accurate measurement across a very wide range: a single UniCond 4-E measures from pure potable water to acid or base concentrations. Applications for the UniCond 4-E series include Clean-in-Place and desalination processes, deionization regeneration, industrial processing, and wastewater treatment. Analog conductivity sensors are prone to signal degradation caused by sensor-to-transmitter cable resistance and capacitance. 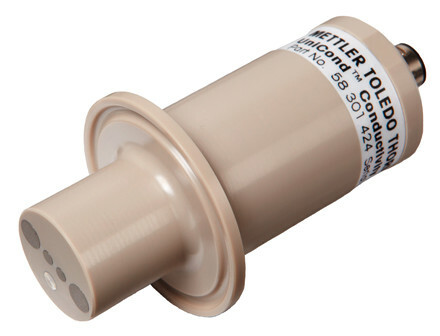 METTLER TOLEDO Thornton has solved this issue by incorporating technology into the UniCond sensors that converts the analog signal into a robust and reliable digital signal. In addition, the sensors contain METTLER TOLEDO’s Intelligent Sensor Management (ISM®) concept. Features of ISM include Plug and Measure start up at the measurement point and sensor diagnostics for proactive maintenance. In addition, the UniCond 4-E can be calibrated without extraction from the process. This makes the sensors compliant with United States Pharmacopeia (USP) guidelines.